Patricia Harmon began entering recipe contests in 1989, but she says she didn’t really get cooking until 1996, when she retired from her office job. Since then, she’s been a three-time Pillsbury Bakeoff Finalist. $5,000 as well as a finalist in 8 other national cook-offs, including three times in the National Beef Cook-Off and twice representing Pennsylvania in the National Chicken Cook-Off, and finalist in 2009 National Cornbread Cook-Off. 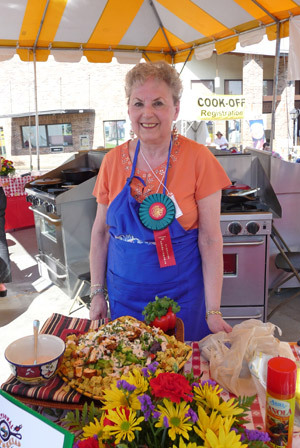 Pat’s cooking prowess has also earned her a 1997 trip to Italy for a local radio recipe contest. “I started entering recipe contests because I have always loved to cook and bake,” said Pat, who is an avid Pittsburgh Steeler fan. NOTABLE WINS: Finalist in 1996, 1998 and 2002 Pillsbury Bakeoff; Winner, 1996 KDKA radio “Taste of Italy” contest; Winner, Grand Prize $5,000 Winner, 1997 Reddi-Wip Contest; Grand Prize Winner, 1999 and 2003 Taste of Home Cooking School; $10,000 Category winner in 2001 National Beef Cook-Off; Grand Prize Winner in Heinz Tailgate Recipe Contest, Steeler Game Package; Grand Prize in Bon Appetit Magazine Contest, a Sub-Zero Wine Refrigerator; Grand Prize Dell Laptop Computer in Newman’s Own “Back-to-School Recipe Contest; Weber gas grill grand prize in Quck & Simple Magazine grilling contest; numerous wins in Better Homes & Gardens Monthly Recipe Contest; numerous runner-up cash and prizes in various contests including several $1,000 prizes in USA Rice Federation contests as well as many in Taste Of Home’s magazines.